When we revamp our food intake to support healthy eating habits, many of us focus on the dinner meal, since it tends to be our biggest meal of the day. Or there’s breakfast—a way to rev up our bodies’ engines. For healthy eating habits and overall wellness, we should be thinking about lunches, too. Here are simple ways to eat healthy and make over the classic quick meals at your desk or at the burger place down the street. Better than Burger and Fries: If you must drive through, give both your ordering style and your presentation a makeover. For instance, even at a fast food burger place there are decent salads. Skip the processed dressings and gobs of cheese and instead top with your own yogurt-based dressing. Or, if you really want a burger, take off the top bun. IDEA: If you’re going for take-out, consider a submarine sandwich place where you can customize your order. Craving some creamy fat? Add avocado instead of mayo on top. Cool it with the Colas: In the middle of the day, we can really start to feel a slump, and that can lead to a craving for sugar and/or caffeine. But soda has long been known as a diet-buster and not so great for your health, either. Look for other options you enjoy. IDEA: Try iced tea to support your healthy eating habits. A glass of organic green tea can be the cold refreshment you crave and deliver a touch of energy, but still provide antioxidant nourishment–unlike cola. Lighten Up Your Leftovers: It’s not only one of the most economical ways to handle your daytime eating needs, it’s also one of the easiest ways to make a lunch. If you’re eating healthy dinners, leftovers can be the perfect solution for lunch later in the week. But round two of your special occasion restaurant meal might not be the best choice. 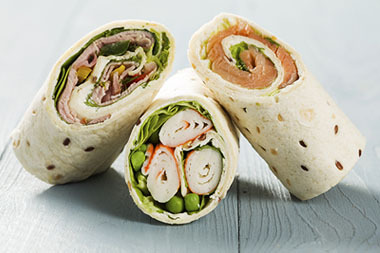 IDEA: Make extra of your healthy dinner proteins and veggies, then bring for lunch in a soft whole grain wrap. Or wrap up different ingredients—see the recipe below! Add all the rest of the ingredients, wrap, and enjoy!